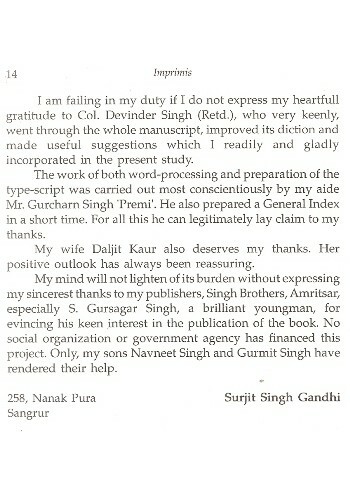 The presnt work is a comprehensive and analytical study of the life of Guru Gobind Singh, the tenth Guru of the Sikhs. 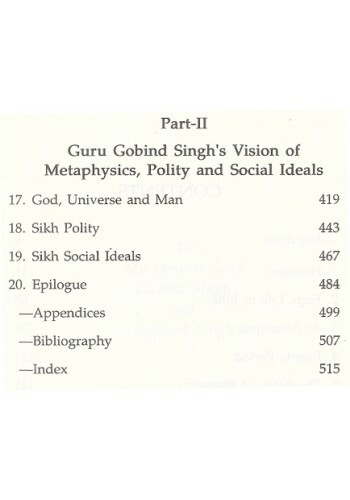 It is an objective account of his response to the contemporary spiritual, political, social and economic conditions, his contribution to metaphysics, social engineering and polity, his attitude towards Muslims as well as Hindu orthodoxy, his floating of the Order of Khalsa, a new model of man as well as of society, his providing of fresh insights and fresh stimuli to make the people dynamic, forward-looking and transcendental in their approach and out-look. 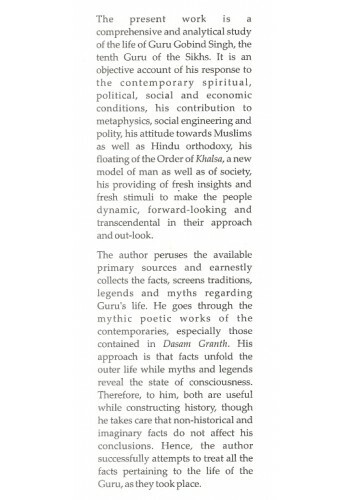 The author peruses the available primary sources and earnestly collects the facts, screens traditions, legends and myths regarding Guru's life. He goes through the mythic poetic works of the contemporaries, especially those contained in Dasam Granth. His approach is that facts unfold the outer life while myths and legends reveal the state of consciouseness. Therefore, to him, both are useful while constructing history, though he takes care that non-historical and imaginary facts do not affect his conclusions. 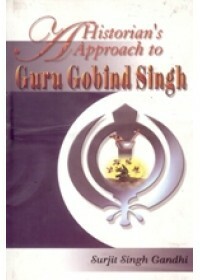 Hence, the author successfully attempts to treat all the facts pertaining to the life of the Guru, as they took place. 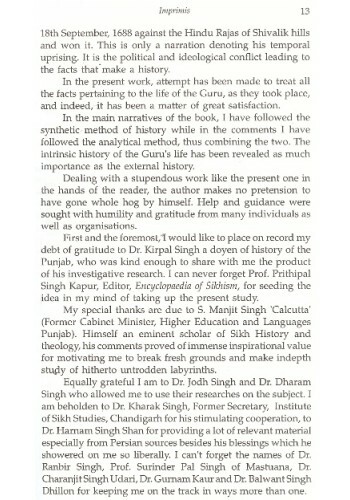 Prof. Surjit Singh Gandhi is a known authority on the History of Sikhs. His Outstanding works, in addition to the present one, are History of the Sikh Gurus, Sikhs in the Eighteenth Century, Perspectives on Sikh Gurdwaras Legislation and Punjab under the Great Mughals; the last one written at the behest of University Grants Commission, New Delhi. He has contributed a number of Research Papers to various journals of repute. 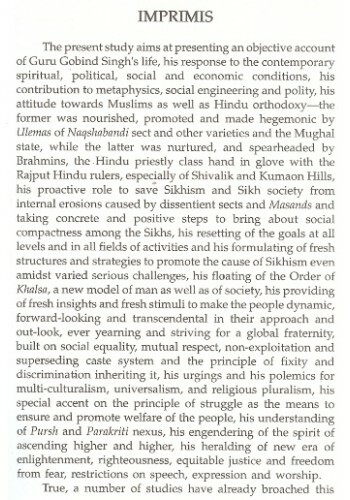 He has also the privilege of writing for the Encyclopedia of Sikhism. He has been honored by the Chief Khalsa Diwan and Punjabi Society Texas , USA. His works are marked for details , in-depth analysis, erudition, clarity adlucidity. He served the Punjab Education Department for thirty-four years, first as a senior Lecturer and then as a Principal. After this, he was called upon to take up the job of Incharge, Sikh Itihas Research Board and Sikh Reference Library, S.G.P.C., Amritsar. Now he is engaged in writing of the History of the Sikhs since partition. 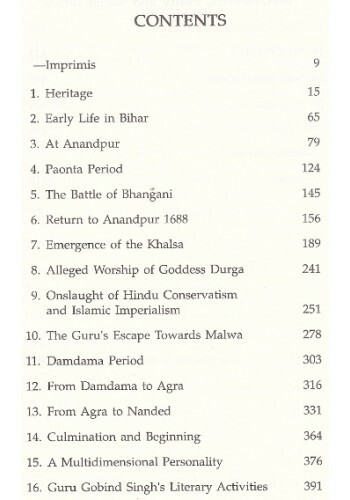 Table of Contents For 'Sikhs in The Eighteenth Century' - Book By Surjit Singh Gandhi ..
Foreword To The Book 'Dynamics of The Social Thought of Guru Gobind Singh' By Dharam Singh Th..
From The Frontcover Of 'The Sikhs In Ferment' By Gurbachan Singh Nayyar The Sikhs in Fe..
From The Frontcover Of 'Perspectives On Sikh Gurudwaras Legislation' By Surjit Singh Gandhi ..